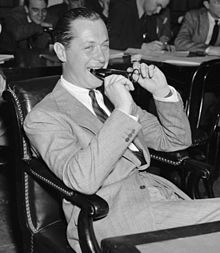 Robert Montgomery (/mɒntˈɡʌməri/; born Henry Montgomery Jr.; May 21, 1904 – September 27, 1981) was an American film and television actor, director, and producer. He was also the father of actress Elizabeth Montgomery. He began his acting career on the stage, but was soon hired by MGM. Initially assigned roles in comedies, he soon proved he was able to handle dramatic ones as well. When WWII broke out, he drove ambulances in France until the Dunkirk evacuation. When the United States entered the war on December 8, 1941, he enlisted in the Navy, and was present at the invasion at Normandy. After the war, he returned to Hollywood, where he worked in both films and, later on, in television. Henry Montgomery Jr. was born in Fishkill Landing, New York (now Beacon, New York), to Henry Montgomery Sr. and his wife, Mary Weed Montgomery (née Barney). His early childhood was one of privilege, as his father was president of the New York Rubber Company. His father died by suicide in 1922 by jumping off the Brooklyn Bridge, and the family's fortune was gone. Montgomery settled in New York City to try his hand at writing and acting. He established a stage career, and became popular enough to turn down an offer to appear opposite Vilma Bánky in the film This Is Heaven (1929). Sharing a stage with George Cukor gave him an entry to Hollywood and a contract with Metro-Goldwyn-Mayer, where he debuted in So This Is College (also 1929). One writer claimed that Montgomery was able to establish himself because he "proceeded with confidence, agreeable with everyone, eager and willing to take suggestions". During the production of So This Is College, Montgomery learned from and questioned crew members from several departments, including sound crew, electricians, set designers, camera crew, and film editors. In a later interview, he confessed, "it showed [him] that making a motion picture is a great co-operative project." So This Is College gained him attention as Hollywood's latest newcomer, and he was put in one production after another, his popularity growing steadily. Montgomery initially played exclusively in comedy roles; his first dramatic role was in The Big House (1930). MGM was initially reluctant to assign him the role, until "his earnestness, and his convincing arguments, with demonstrations of how he would play the character" won him the assignment. From The Big House on, he was in constant demand. Appearing as Greta Garbo's romantic interest in Inspiration (1930) started him toward stardom with a rush. Norma Shearer chose him to star opposite her in The Divorcee (1930), Strangers May Kiss (1931), and Private Lives (1931), which led him to stardom. In 1932, Montgomery starred opposite Tallulah Bankhead in Faithless, though the film was not a success. During this time, Montgomery appeared in the original pre-Code film version of When Ladies Meet (1933), which starred Ann Harding and Myrna Loy. In 1935, Montgomery became president of the Screen Actors Guild, and was elected again in 1946. In another challenging role, Montgomery played a psychopath in the chiller Night Must Fall (1937), for which he received an Academy Award for Best Actor nomination. After World War II broke out in Europe in September, 1939, and while the United States was still officially neutral, Montgomery enlisted in London for the American Field Service and drove ambulances in France until the Dunkirk evacuation. He then returned to Hollywood and addressed a massive rally on the MGM lot for the American Red Cross in July 1940. Montgomery returned to playing light comedy roles, such as Alfred Hitchcock's Mr. & Mrs. Smith (1941) with Carole Lombard. He continued his search for dramatic roles. For his role as Joe Pendleton, a boxer and pilot in Here Comes Mr. Jordan (1941), Montgomery was nominated for an Oscar a second time. After the U.S. entered World War II in December 1941, he joined the United States Navy, rising to the rank of lieutenant commander, and served on the USS Barton (DD-722) which was part of the D-Day invasion on June 6, 1944. In 1945, Montgomery returned to Hollywood, making his uncredited directing debut with They Were Expendable, where he directed some of the PT boat scenes when director John Ford was unable to work for health reasons. Montgomery's first credited film as director and his final film for MGM was the film noir Lady in the Lake (1947), in which he also starred, which received mixed reviews. Adapted from Raymond Chandler's detective novel and sanitized for the censorship of the day, the film is unusual because it was filmed entirely from Marlowe's vantage point. Montgomery only appeared on camera a few times, three times in a mirror reflection. He also directed and starred in Ride the Pink Horse (1947), also a film noir. Active in Republican politics and concerned about communist influence in the entertainment industry, Montgomery was a friendly witness before the House Un-American Activities Committee in 1947. The next year, 1948, Montgomery hosted the Academy Awards. He hosted an Emmy Award-winning television series, Robert Montgomery Presents, which ran from 1950 to 1957. The Gallant Hours (1960), a film Montgomery directed and co-produced with its star, his friend James Cagney, was the last film or television production with which he was connected in any capacity, as actor, director, or producer. In 1955 Montgomery was awarded a Tony Award for his direction of The Desperate Hours.. In 1954, Montgomery took an unpaid position as consultant and coach to President Eisenhower, advising him on how to look his best in his television appearances before the nation. A pioneering media consultant, Montgomery had an office in the White House beginning in 1954. Montgomery has two stars on the Hollywood Walk of Fame, one for movies at 6440 Hollywood Boulevard, and another for television at 1631 Vine Street. On April 14, 1928, Montgomery married actress Elizabeth Bryan Allen (December 26, 1904 – June 28, 1992), sister of Martha-Bryan Allen. The couple had three children: Martha Bryan, who died at 14 months of age in 1931; Elizabeth (April 15, 1933 – May 18, 1995); and Robert Jr. (January 6, 1936 – February 7, 2000). They divorced on December 5, 1950. His second wife was Elizabeth "Buffy" Grant Harkness (1909 – 2003), whom he married on December 9, 1950, four days after his divorce from Allen was finalized. Montgomery died of cancer on September 27, 1981, at Columbia-Presbyterian Hospital in Manhattan. His body was cremated and the ashes were given to the family. His two surviving children, Elizabeth and Robert Montgomery Jr., both died of cancer, as well. ^ Variety obituary, September 30, 1981. ^ a b c R.E. Lee. "Robert Montgomery Biography". The Earl of Hollywood. Retrieved 4 June 2014. ^ "Elizabeth Montgomery's Family Tree" Archived 2016-03-03 at the Wayback Machine, Bewitched.net; retrieved August 4, 2010. ^ "3 Drown in Hudson ..." The New York Times, July 3, 1922. ^ a b c d "Garbo's Lover in 'Inspiration' Was Lucky Role for Montgomery". The Milwaukee Journal, March 22, 1945, p. 1. ^ Mayer, Geoff; McDonnell, Brian (2007). Encyclopedia of Film Noir. ABC-CLIO. p. 355. ISBN 0313333068. ^ "Robert Montgomery Tony Awards Info". Wisdom Digital Media. Retrieved April 3, 2019. ^ "Behind the Scenes: Robert Montgomery." The New York Times, March 1, 1956. ^ Brownell, Kathryn Cramer (2014). Showbiz Politics: Hollywood in American Political Life. UNC Press. p. 141. ISBN 1469617927. ^ "Elizabeth Allen a Bride". The New York Times, April 15, 1928, p. 27. ^ "R. Montgomery Marries". The New York Times, December 12, 1950, p. 47. 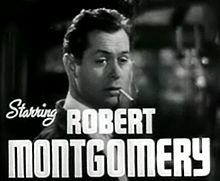 ^ "Robert Montgomery, actor-producer, dies". The Galveston Daily News. Galveston, TX. United Press International. 28 September 1981. p. 6. Archived from the original on December 4, 2018. Retrieved 17 January 2017 – via Newspapers.com. ^ Pilato 2012, p. XV. ^ "Radio Highlights". Harrisburg Telegraph. Harrisburg, Pennsylvania. July 31, 1942. p. 11. Retrieved August 18, 2015 – via Newspapers.com. Pilato, Herbie J. Twitch Upon a Star: The Bewitched Life and Career of Elizabeth Montgomery. Lanham, Maryland: Rowman & Littlefield, 2012. ISBN 978-1-58979-749-9. Wikimedia Commons has media related to Robert Montgomery.